Remember the day when you took your iPad out of its box for the first time? How fast it ran? How snappy it was? Yeah, those were the days. For me, these days are long over; I am still rocking a first gen iPad that is getting a little old after more than three years of great use. But why upgrade when it still works? In this post, I am sharing 7 simple tricks how you can speed up your iPad (and iPhone) to squeeze some more life out of it. I am not pretending that this will make your old iPad act like a new one. There are some physical limits on what an older model can do. But I can tell you this: These seven tricks transformed my iPad from “a pain to use” to “reasonably fast”. In my books, this is a huge win, because I am able to wait out another entire iPad generation before upgrading. I know what you are thinking: You have seen posts like this before, so how is this one different? Well, because I actually took the time and researched it. And guess what: what most people will tell you about how to speed up your iPad – closing apps and rebooting the device – will in most cases not help a bit. Is your iPad running slow? Check out these seven simple tips to impressively speed up your iPad. 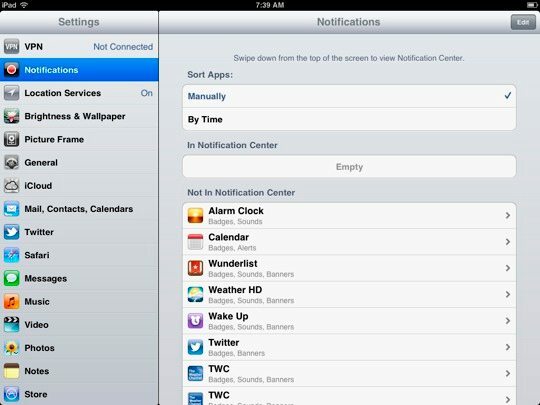 You have heart this before: close down apps in the multitasking bar and restart your iPad in order to speed it up. Although virtually every “speed up list” out there will tell you to fiddle around in the multitasking list, your efforts will not result in any long-lasting improvements. Often, nothing will even change in the short term. The idea that closing all apps in the multitasking bar would free up massive resources in working memory is just a myth. You can read my more detailed post in order to get the full picture, but trust me on this: Generally speaking, it is not worth your effort. There are a few exceptions: Apps that perform background tasks (pretty much limited to email apps, GPS apps, active music apps, Skype and other VoIP apps) can be closed down via the multitasking bar in order to free up working memory. And of course, if an app constantly crashes, closing it manually or rebooting your device can help. You can get the full info in my original post. For all other apps: relax. There is really no need to micro-manage your multitasking bar – iOS is doing this just fine. The other tip you read everywhere is of the “kill ’em all” variant: Completely wipe your iPad and do a fresh install of iOS (see step-by-step instructions here). I don’t think this is a good way to speed up your iPad. First of all, it will take you much longer than following my seven tips described below. And second, you probably revert back to the old sluggishness in no time if this is all you do. Again, your efforts would be (soon) wasted. Following the seven tips described below are much more important to keep your iPad speedy. I tried them out with my first-gen iPad, and it is much snappier now! And even if you are working with a newer model – give them a try! It’s always good to do a little spring cleaning session once in a while. Updating the firmware is always a good idea in order to get the latests features and security fixes. For updating your iOS, just go to the General tab in Settings and tap on Software Update on the right side. The device will check if a new iOS is available, and if so, will guide you through the process. This tip is only relevant when you hardly have any disk space left – and I mean really no disk space left. Something in the order of less than 1 GB. In order to find out how much space you have left, go to the General tab in Settings and tap on Usage on the right side. Give it a second, it’s going to space (no, it doesn’t, I just needed an excuse to share Louis CK with you), and after a short moment you see how much storage you have available / used. If you still have a GB or so available, don’t worry – you are good. Only if you are really running out of space, you can go through this list and see what hardly used apps gobble up all your storage space. That’s the guy who gets deleted first. This is for music lovers: If you are anyhow like me, your music library probably takes up a large part of your storage space. I ran into acute problems with that on my iPhone. My solution wasn’t cutting down on music – no way! Instead, I started a music subscription with rdio. Since rdio requires a monthly fee this is not the cheapest solution, but it is a way better value than buying devices with higher storage capacities. You can read the full story on how I decided on how much storage I need on my iPad here. But back to the current topic: When you are running out of storage capacity, deleting some bigger apps or switching to a music subscription can speed up your iPad. Your browser cache is another place where you can reclaim some storage space, which might result in slight speed improvements. Whenever you visit a webpage, Safari will automatically save its content in its memory cache. The idea is that it will be faster to re-visit a webpage, but over time the browser cache fills up to an extent that it can slow down your browsing experience. So from time to time, it makes sense to “bring out the trash”. Clearing the browser cache is something worth doing once every few weeks or months – depending on how much you are browsing around. In Settings, find Safari on the left side and tap on Clear Cookies and Data on the right site. Affirm by tapping Clear in the popup window. Follow academiPad on pinterest to see our freshest pins on how to study in style, and don't forget to pin this post to your own board as well. This is a bonus tip which obviously will only work for your iPhone: Clear out old text messages. I was impressed with the results. Inserting text on my iPhone 4 got horribly slow, and this tip gave me a real speed boost. The above tricks are mainly about reclaiming storage space and slimming down apps to run faster. The most important thing when it comes to speeding up an aging iPad, however, is to maximize available working memory (RAM). Since the first-gen iPad is equipped with only a quarter of the RAM that is found in gen 4, freeing up RAM becomes imperative. The next four tips tell you exactly how to maximzie working memory, so that you will enjoy a long-term speed enhancement. The good news is that these are settings which you only have to do once. Do it now, and then be done with it. There’s one catch though: It means that you have to say good-bye to some of the latest iOS featues. I know that this is not cool, but these four simple things also offer the greatest results. And at the end, cutting down a little bit on the bells and whistles of iOS is a small price to pay when it means that I can use my device for another twelve months or longer. This is a great but little know tip! Many apps, when first launched, ask you whether you want them to notify you about important updates and other stuff. At the time, it seemed like a good idea, but after a while you have a ton of apps that want to push notifications to you that are – let’s be honest – often not that important. Get rid of these notifications in order to free up resources. In Settings, go to Notification and clear out all the apps like in the screenshot. Don’t worry about alarm clocks – they will still wake you up. You will be also still reminded of upcoming events in iCal, provided that you have scheduled an alert. The next thing you want to turn off are location services. In Settings, go to Location Services on the left site. On the right site, you can either turn all location services off or you can decide this on a case-by-case basis. I suggest you switch off lcoation services on a case-by-case basis, because using the “kill all” switch will also disable the “Find my iPad” service. That’s too much of a security risk. I personally only activate location services for Safari (for local search results), weather apps (for getting the right weather), and obviously maps. Another great way to take some burden off your iPad is to give it a break indexing content on your iPad. By default, iOS systematically goes through your contacts, applications, mails, notes, messages and much more in order to be “ready” whenever you use Spotlight Search. Now the thing is: How often do you really need to search your emails or contacts on a global level? When I am searching for an email, I search from Mail. When I am searching for a contact, I open Contacts. The only time I really use Spotlight Search is when I am looking for an app that I can’t find in the chaos that Apple calls homescreens and folders. 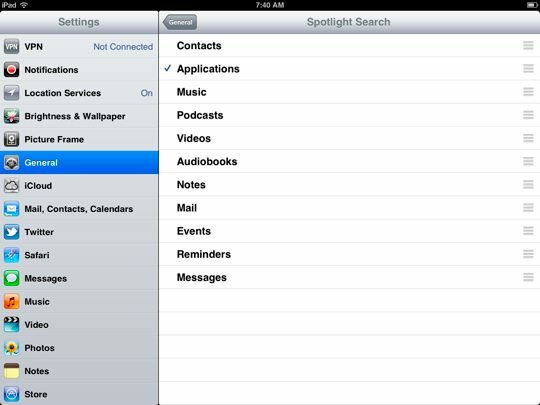 If this sounds like you, then switch off Spotlight Search for all items except Applications. To do this, go to Settings, General, and then Spotlight Search on the right side to uncheck all unwanted items. One more thing you can switch off are the four-fingers multitasking gestures. This is where it begins to hurt a little bit in my opinion, since it is quote convenient to circling through the last used apps via four-finger swipes to the left and right. But hey, doing a double click on the home button isn’t the end of the world, so I switched off Multitasking Gestures in the General tab of Settings. Other things that have been reported to speed up sluggish iPads are to turn off keyboard Auto-Correction and Check Spelling in the Keyboard part of the General tab. However, I don’t want to miss these features, so I left them on. The same is true with everything iCloud related. By switching off iCloud sync you can gain some working memory back, but this would really hurt. In my experience, it’s not worth it switching this off. These tricks really helped speeding up my aging first-generation iPad, and I didn’t even have to resort to the clean-slate, sledge-hammer, wip-it-all-and-re-install approach. My first-gen iPad is not super fast now, but it is also not super sluggish any longer. I got some more life out of it, and that’s all I wanted to achieve. Did these tips work for you? Do you have another great idea for how to speed up a slow iPad? Please share your thoughts in the comments. Disclaimer: This article contains affiliate links. Please consider sharing this article if you found it useful. Did you enjoy this article? Please join academiPad's RSS feed to get free updates with even more tips on research, teaching and learning! Here are six reasons why. Well done it made quite a difference to the speed. Thank you. Ps your research theme sounds interesting? I understand how people buy in relation to who they are , or want to be; and, perhaps the more I think on it , how their view of nature may influence their consumption – but the link between the two? Or , are they two distinct and unrelated research interests? Thanks Lesley! These are two distinct research themes for me. Wow – I’m impressed, clear & simple instructions and it really did work. The only thing I did not do was update my iOs as the last time I updated it seemed to cause problems and slow my iPad down. Also ( I’m not sure im using correct terminology here) I read that updating the IOS can make some apps that you already had on your IPad no longer viable? This did happen to me with a book app that no longer worked saying I needed a later iOS version to run the app, but iPad 1 too old to update to that particular iOS. I hope this makes sense??? Do you know anyway round installing some of the most popular apps that used to work on iPad 1 but are no longer available in a version that suits iPad 1? Sorry, I don’t know how you could do that. Had already performed all but the location service shut down. I bought my ipad 1st gen about 3 months ago and it works fine for my needs. If speed is an issue, i just pull my 5S out of my pocket. Or grab my girlfriends mini. But it never really comes to that. I payed 175$ for a 64gig with 3G on craigslist and and its exceeded my expectations being a dinosaur and all. Gaming blows, but i generally dont think much of iphone/ipad games. Ive got 2 xbox Ones and 2 PS 4’s for gaming. But laying in bed sufing the web, awesome. Streaming movies from comcast, flawless. Watching youtube, perfect. The only reason i would get a new one was to give this one to my kid so i wouldnt have to come home only to find my ipad with a 12% charge after hes been playing with it all day. I dont know what the run time is in a full charge, but it lasts longer than i’ll ever use it in one setting. Ive spent max 4-5 hours on it. Never ran out of juice or even got close. My kid will play with it all day 10 hours not plugged in, and still has 10-15%. i do have a special charger the guy sold me with it, at least that was his story. Regardless, im totally happy with it. 175$ bought a cool toy, not gonna compete with the A-7, but for what i do with it, it dont really need to. Yes, it works! I turned off notifications, multitask gestures, Spotlight search and some localization services and it seems to run faster!